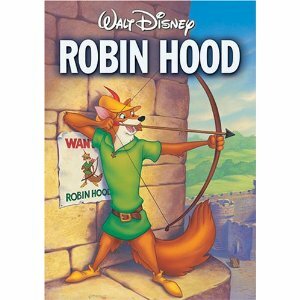 This animated Disney classic from 1973 is based on the famous thief Robin Hood, who fed the poor with the riches of the wealthy. In this version, Robin and Maid Marian are foxes, and Little John is a bear. Therefore, it is needless to say that this is not your ordinary tale. However, as always, Disney does an excellent job of turning a story of harsh realities into a lighthearted tale for the whole family. Unbelievably, I went through my whole childhood without ever seeing this film…and I’m honestly not sure how I managed, now that I have finally seen it. Everything about this made me smile. There were laughable moments, touching scenes, and of course, the animators did a brilliant job in the designs/drawings throughout. This comes as no surprise, being said animators were Milt Kahl, Frank Thomas, Don Bluth, Ollie Johnston, Floyd Norman, etc. There is always something about the beginning of a Disney film which makes my heart purely happy, and that is the very beginning. The format of the opening credits, and soft melodic tone in the background let you know that not only are you are about to watch a classic, but you can feel Uncle Walt’s spirit ringing through every moment. The opening song, “Oo-de-lally”, reminds me a lot of the famous “Hamster Dance” song. I’m not sure if “Hamster Dance” is dedicated to keep the memory of “Oo-de-lally” alive, but if not, they sure do sound similar. The writers did a fantastic job of giving the animated characters some brilliant lines, many of which brought laugh out loud scenes. One of my favorite lines was by Lady Kluck, when she informed Maid Marian of having Robin’s being part of the family as “an outlaw for an in-law.” Such a simple and yet delightful line. This may be completely random, but I thought the spires on King Richard’s (or Prince John’s, depending on how you view it) castle resembled those on Cinderella’s Castle in the Magic Kingdom park of Walt Disney World. Again, this may be completely a coincidence and I am most likely seeing things. The fact that the storyline went along with Robin and Marian growing up together was touching, especially when you add in that Marian was afraid Robin would not remember her. Therefore, the archery tournament means so much more when he is masked with a beak, but the gleam in her eyes shows that she realizes who it is. The voice actors performed incredibly throughout the duration of the film. You could honestly feel a connection among them, which shined through the animated characters. Brian Bedford voiced the one and only Robin Hood. Bedford has appeared in a few episodes of television shows, both American and British; I remember him most from a hilarious episode of Frasier. He continues to act to this day. Monica Evans voices Maid Marian. Evans gave us the lovely Abigail in The AristoCats, as well as the funny but irritating Cecily Pigeon in The Odd Couple. (Sidenote: I played a Pigeon sister in my college’s acting class once. Had a lot of fun with that one.) Peter Ustinov voiced both Prince John and King Richard. Ustinov has appeared in many timeless films including Spartacus and Logan’s Run. Pssst…he also made an appearance in The Great Muppet Caper as the truck driver! Terry-Thomas voices Sir Hiss, the awesome sidekick snake in this film. Sir Hiss is one of my favorites. Phil Harris voiced the beyond wonderful Little John. Harris also gave us Baloo in The Jungle Book and O’Malley in The AristoCats, two fantastic characters from Disney’s classic history. We also have Andy Devine who portrayed the sweetheart Friar Tuck. I remember Devine most from a Twilight Zone episode, but he is most famous for being in many Westerns including 1939’s Stagecoach alongside John Wayne. Now, the vultures were voiced by George Lindsey (Trigger) and Ken Curtis (Nutsy). Lindsey is most remembered for playing Goober Pyle in The Andy Griffith Show. Another Disney connection includes voicing Lafayette in The AristoCats. I LOVE Ken Curtis. He portrayed the lovable Festus Haggen in the long running series Gunsmoke. I grew up watching this show, thanks to my dad always having the repeats on. Curtis’ voice absolutely stands out! My favorite character in this film is Friar Tuck. I have a reason for this. My parents and I were getting ready to leave the Contemporary Resort on Walt Disney Resort property after a wonderful vacation in 2002, and Tuck appeared from out of the blue. I was beginning to walk out the door, and he grabbed my arm and led me back in. I laughed and turned around to walk back out, and he turned me the other direction once again. Much laughter (and a few tears) were had. Disney once again gave me a moment to remember for the rest of my life, and for that reason alone, I have always held a special connection with Friar Tuck. As for my favorite scene in the film, any of the scenes with the vultures would rank at the top. I ADORE Nutsy and Trigger. Everything about this film is wonderful, from the music to the production crew to the directors. The director was…wait for it…none other than the outstanding Wolfgang Reitherman, who also gave us The Rescuers, The Many Adventures of Winnie the Pooh, The AristoCats, The Jungle Book, The Sword in the Stone, and 101 Dalmatians among many others! The theme of Robin Hood is very realistic to this day, especially pertaining to the reminder in the beginning…”rob the rich to feed the poor” versus “rob the poor to feed the rich.” The latter seems very true in society, and in many ways, we all want a Robin Hood to save us from economic grief. That being said, we can all relate to this film in a way, and I feel that Disney proved themselves yet again in producing a wonderfully heartfelt film with a continuously maintained powerful message. Oh, he’s so handsome, just like his reward posters.